Little Vera accompanied me to the Pop Up Shop, and look what she loved! And wanted! Now THAT'S more like it! 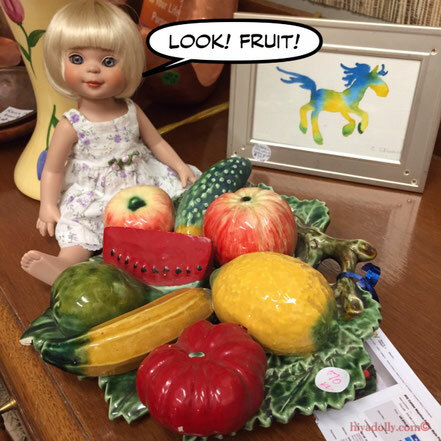 After a couple of weeks of treats in Dolltown...Healthy fruit! But, dear Vera...I'm sorry to say it is just an art piece. 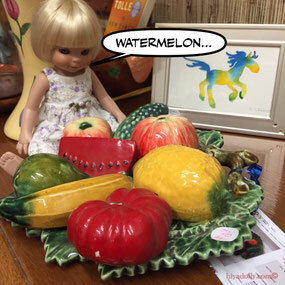 All the fruit is stuck on that plate. And cost as much as a filet mignon at Hy's Steakhouse. How hard was it to say no to this cutie?! 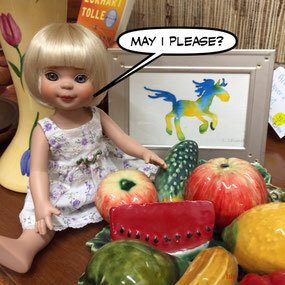 How about we carry on to our favorite grocery store and find some REAL fruit, for REAL dolls! Okay, she said, smiling. I love Vera!